​This expression has three different operations: subtraction, multiplication, and addition. A common mistake is for students to just work from left to right. Make sure to follow the order of operations! Go step by step. ​Any parentheses or grouping symbols? No. Any exponents? No. Any multiplication or division? Yes. This means you need to multiply first. Multiply the 3 and 4 together and bring down the rest of the expression. Now you have addition and subtraction. Addition and subtraction are together in the same step. If you have both, you do the one that comes first from left to right. This means you need to do the subtraction and then the addition. The most common mistake on a problem like the one above is to add and then subtract. Make sure to remember that addition and subtraction go together in the same step. 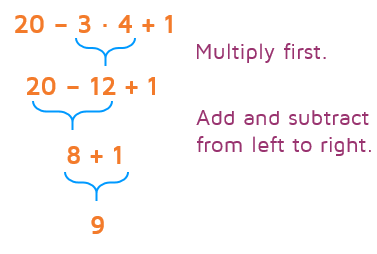 Work your way from left to right if you have both addition and subtraction (or if you have multiplication and division). Start with Step 1: Any parentheses or grouping symbols? Yes. Start by simplifying what's inside the parentheses. There are two operations inside the parentheses: subtraction and an exponent. Which one comes first in the order of operations? Exponents. This means you need to simplify 3 squared first and then subtract. This leaves you with two operations left: division and multiplication. Which one comes first in the order of operations? 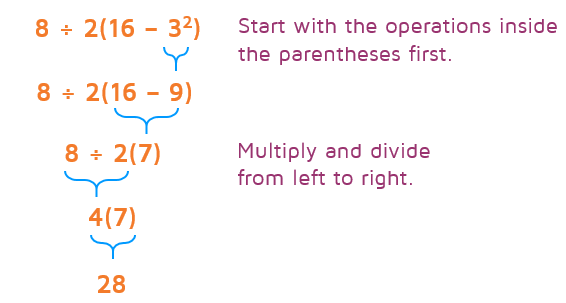 Division and multiplication go together in the same step, so you do the one that comes first from left to right. In this problem, we need to divide first and then multiply.